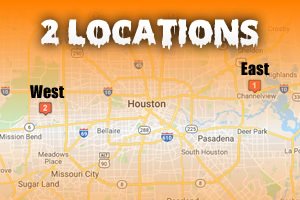 We have 2 locations in the Houston metro area, selling all your favorite Halloween Costumes, decorations and accessories. All Stores are stocked with all products. Please note that inventory levels vary by store. Call a head to verify stock if you are looking for a particular costume in a specific size.